It’s on the news a lot these days. Whether it’s a giant retail corporation or an insurance company, or even the small business further down your street, someone somewhere is experiencing a data breach of sorts and private data is getting stolen. Or maybe a company reports a system crash that sends a number of people’s profiles into a wacky spin, misplacing people’s information, or reflecting incorrect information. People have lost their homes because of such system compromises. Maybe as you’re reading this, you’re not thinking it’ll happen to you, but it certainly can. Companies like to collect information about their customers and clients because it helps them make more strategic decisions. And some of that information might be yours. Your insurance, your healthcare, they all have your information on file so that they know who you are when you contact them. And if you’re the owner of a business, or part of a business that is affected, you can be really sure that there’s something to worry. Not all information about you that gets compromised is going to be extremely important. It could be something as harmless as knowing your age number. But you don’t know exactly what data has been taken. It could also be something as important as your social security number. Whatever the information, when these data breaches happen, it is very costly to repair and damages to a company’s reputation can be immense. 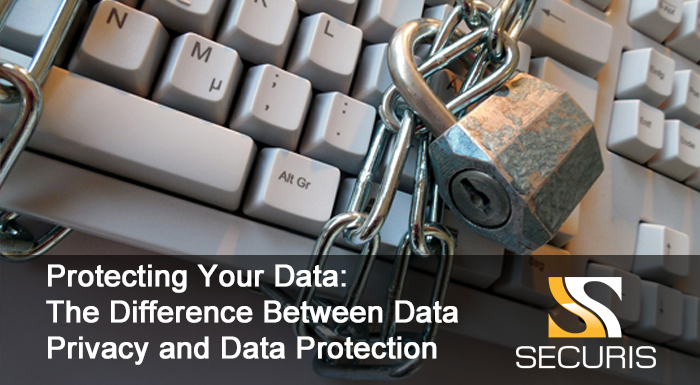 That is why it is important to learn the differences about Data Privacy and Data Protection. Knowing how to protect your information as well as how to prevent your information from possibly getting compromised in the first place is key to keeping your personal information as safe as possible. Data Protection is what happens to help protect and safeguard your information. This includes your information becoming corrupted, stolen, or otherwise compromised. The more we use technology, especially technology that connects us with others, the more reliant we become on data protection to ensure that we are secure in passing information on to others. The amount of data that the world uses for personal information grows with each minute. The different places where we store all of this data depends on data protection to keep your data from getting lost. Data protection also involves crafting strategies and procedures to restore corrupted information. In this sense, data protection is also about data maintenance. In fact, repairing data or backing up data is a large part of data protection. This is why organizations like to use Cloud storage as a means of backup or by having a third-party provide backup copies of important data. This is how companies ensure that their wealth of information is kept intact, even after many years. Another way that companies protect your data is by improving network security as well as information practices within their corporation. This is to ensure that your data, should it be needed to be moved, gets moved only to where it needs to be. Secure data movement means less chances of your information getting into the wrong hands. Data Privacy has more to do with what an organization, company, or individual may do with your information that you give to them, and how it may be shared or discussed with third-parties. You may often see this in little messages when you’re filling out a form or registering on some website, you might read a message somewhere that asks you to confirm that you’re okay with your information being shared for marketing purposes. These are all cases of where you need to take your data privacy into mind. But what’s the best way to ensure your data privacy? The best way is to make the decision of whether you need to share certain information or not, and who can access it. What you choose to not share will be less likely to ever get exposed and compromised. In Closing: Where Does It All Come Together? You can’t hide everything about yourself forever. You do have to give a lot of personal information out for things such as health insurance, or anything related to federal services. Your job is going to want your personal information to verify your identity and know who you are. Your favorite mobile app game might want your email so that it can tell you when you can earn more points or coins on certain days of the week. Therefore, your data privacy practices will need to be complemented by an organization or company’s data protection practices. In the end, data privacy and data protection must work together, to provide a comprehensive net of protections and to make sure there are no leaks for your data to become compromised. Need an IT Asset Disposal Solution? Whether you need hard drives destroyed to prevent data from getting into the wrong hands or getting some of your electronics properly recycled in compliance with e-waste regulations, be sure to contact us for your IT asset disposal needs. We’ve been providing excellence since 2003!